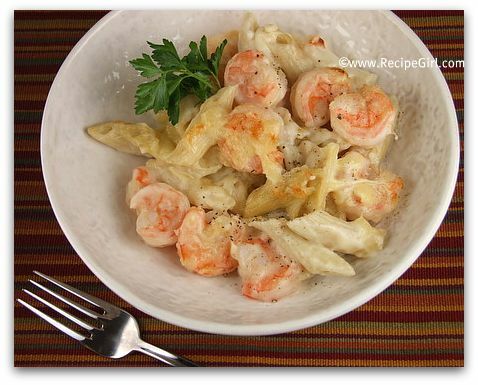 Here’s my latest dinner find that was a success with the entire family: Creamy Gruyere and Shrimp Pasta. You can use frozen shrimp, but fresh is best. If you have a good seafood source, sometimes they sell them already peeled & deveined. Just pull the tails off and you’re all set. 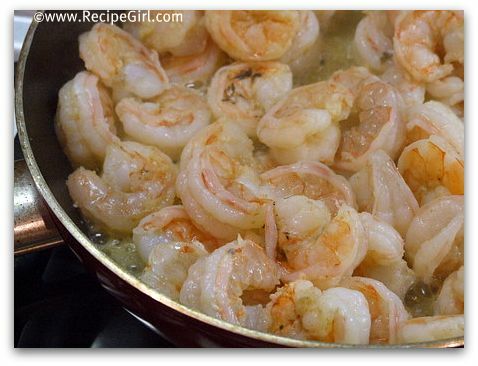 That wonderful shrimp is sauteed with light butter, garlic, wine and touch of cayenne. We are quite enamored with creamy pasta dishes, but in this time of healthy-eating in the RecipeGirl household… they are not being served up all that often. This one was the exception- it was made to be on the healthier side of things- as healthy as a creamy pasta can be 🙂 The cream sauce is made up of nonfat milk, flour & salt. 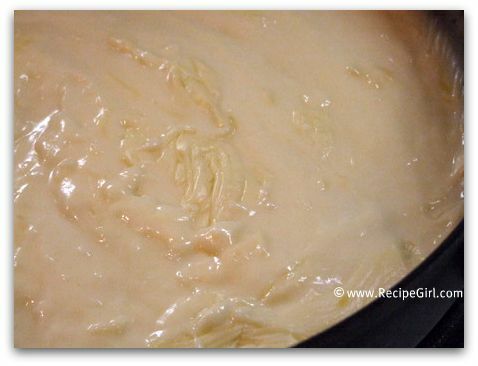 Cheese is mixed in to make the creamy sauce. If you can’t find Gruyere, Swiss is a close substitute. 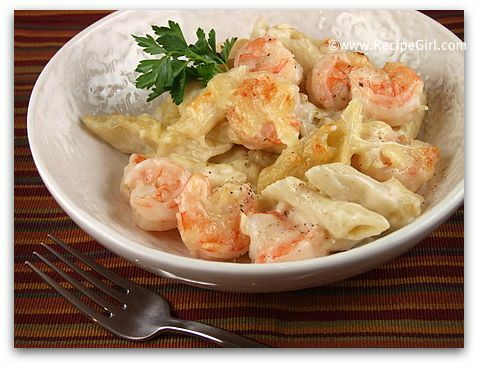 The shrimp is mixed with the cream sauce and whatever pasta you’ve cooked up. 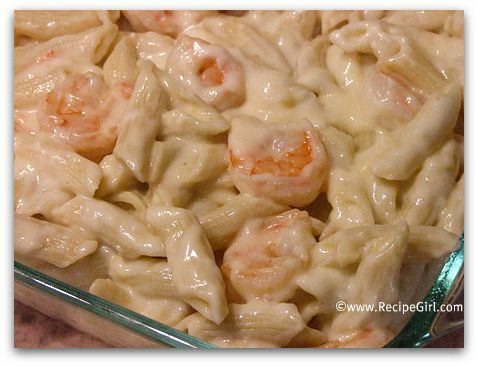 I like the tube-pasta (like penne) with a cream sauce since the sauce gets trapped inside the pasta and thus creates more flavor in every bite! The mix is baked for about 20 minutes with a little more of that cheese sprinkled on top. It’s usually after a dinner like this that I hear, “Mom, you’re the best Mommy ever!” and “Honey, this is Restaurant Quality!” Needless to say, the family loved this dinner. Though I don’t typically repeat recipes, I’m going to have to make this one again. This is an easy, easy dinner to make… even if you don’t think you know how to cook very well. Your family will be so impressed. 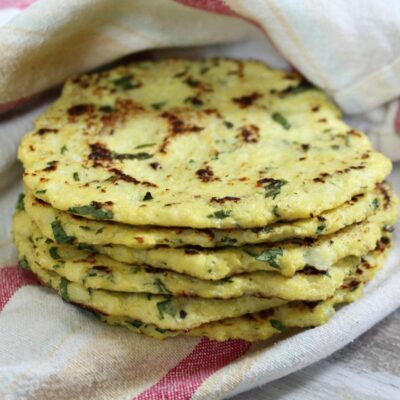 And if you are a seasoned cook and you’re family expects great meals from you, then you’ll be pleased to have a dinner that you can add to your quick and easy pile. 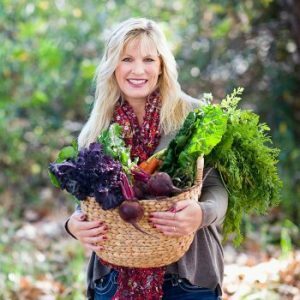 I served this with the Watercress-Grape Salad with Creamy Cabernet Dressing– perfect! A wonderful addition to this recipe would be bacon. It would make this dish even more savory and delicious. The bacon would pair really well with chicken too for those of you who don’t like seafood. YUM! Lori, I want to dive into that gooey pool of gruyere. Perhaps the shrimp are my floating devices? I imagine that really was great with the salad. 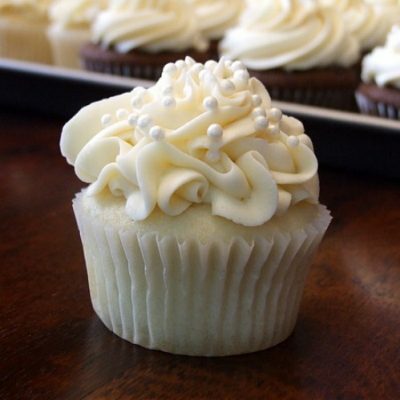 It looks positively decadent, even with the lighter ingredients providing the creaminess. Delicious. I hope my little girl is an adventurous eater! This sounds DELICIOUS! Hard to believe that this one is not a fat-laden cream sauce! Looks wonderful! Oh my gosh, I just made this for dinner tonight and it was FABULOUS!!! I halved the recipe since it’s just me, and it was all I could do not to eat all 3 servings in one sitting! Thank you for sharing this! Oh yum. I should stock up on some lactose pills and make this! Hi there! I just want to say that I love your blog and I have been following it for a long time now. I give you a big high five for your blog and I’m jealous! Hee Hee. 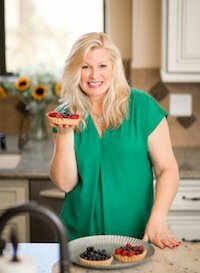 You have the best recipes, and I use a lot of them. Thanks for that. That is my passion, cooking. I just don’t have enough time to take pictures everyday and post about it. I wish I did! My hubby is sitting next to me while I’m reading this, he saw the picture of the shrimp and said ” What’s that”!!! Guess who’s gonna be makig this ! LOL!! Oh my! I would love this for dinner. Bookmarking! Wow! This dish looks totally delicious. 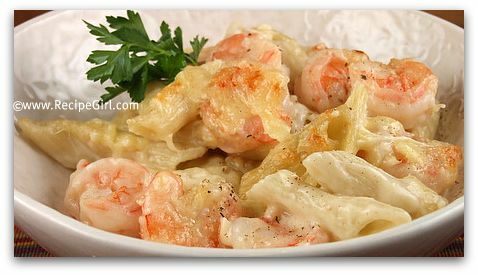 I love shrimp–and I adore gruyere. What an awesome combination! This looks amazing! The perfect comfort meal! Oh that is creamy to the max! The sauce looks delicious!! !